Our group got up and out an hour early today to try and beat some of the weather and get in a few stops along the way to Wellington, the capitol of New Zealand. The weather continued to dump rain on us along the way, but we got a lucky break when we stopped to do a Gumboot toss in Taihape. 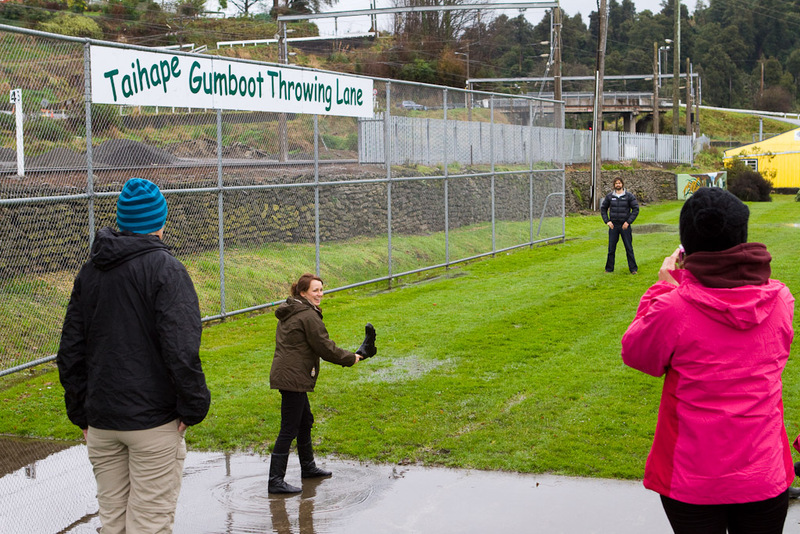 The rules were pretty simple – girls throw first and the mark is set by the furthest toss. Guys HAVE to throw and each throw that falls short of the mark is a piece of clothing they have to remove. If they quit, they owe the girl that made the mark a drink. All the guys made it but a few got to their socks before succeeding. I had to take my hat off after missing my first toss but hit the 2nd throw. The signpost in Bull, New Zealand. Each of the individual storefronts also has a big sign with their appropriate saying. We stopped for lunch in Bull, a town with an interesting claim to fame. 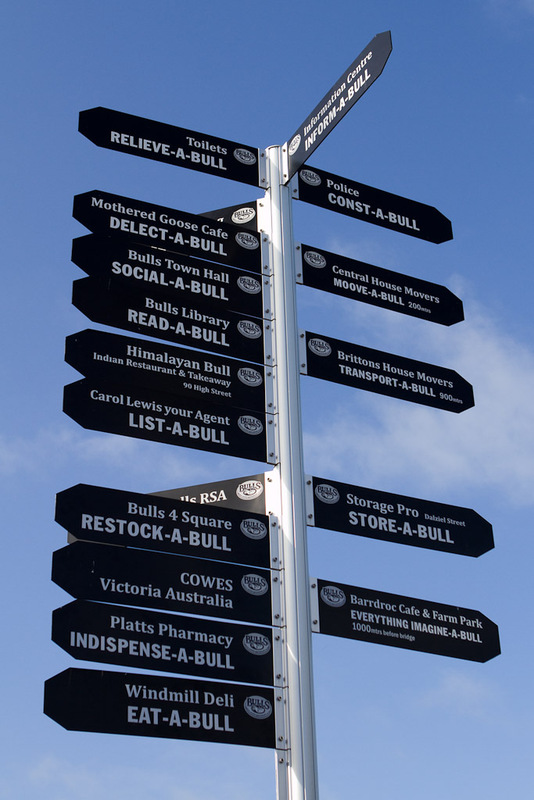 They’ve tried to use the town name in as many phrases as possible such as “eat-a-bull” for the Windmill Deli and “read-a-bull” for the library. After lunch we hit up a huge playground in one of the small towns along the way. Nothing like a couple hamster-wheel-like things, a flying fox and a few variations on swing sets to bring a smile to the faces of a bus full of travelers. 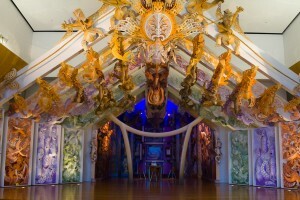 An exhibit at the Te Papa Museum. We arrived in Wellington around 3pm with enough time to check in at Base Wellington and then get to one of the main attractions – Te Papa. Te Papa is arguably the best museum in New Zealand, with the lower floor containing exhibits geared towards younger visitors and the upper floors appealing to an older crowd. The art and cultural exhibits are particularly interesting. The majority of our bus met in the lobby of Base and then trekked over to a noodle house on Cuba Street where I taught one of the tribe how to use chopsticks, which thrilled her to no end. After dinner, we met up for drinks at a corner bar and made plans to get back together in Queenstown for sushi. Goodbyes and see-you-laters were said and hugs were given.